Felix Kersten was the mysterious, personal physical therapist of SS commander Heinrich Himmler. He said he saved the lives of tens of thousands of concentration camp prisoners. Was he a saint or a devil in disguise — or both at once? Who was this Himmler’s janus-faced Finnish masseur and why can’t documentary filmmaker Arto Koskinen stop following him? The Felix Kersten Files podcast is based on Arto Koskinen’s experiences in making the film ‘Who was Felix Kersten?’ in the late 1990s. The film was meant to tell the story of a good and forgotten Finnish masseur, but the filmmakers soon found out forgeries and secrets in Felix Kersten’s story. Now, more than 20 years later, Koskinen wants to answer questions that never stopped bothering him. Why doesn’t Felix Kersten’s story fall neatly into place? What is the truth about this talented man who could meld into any environment? Did European nations protect Nazi Germany’s core even after the war ended? Appearances: John Bernstein, Toby Bernstein, Andrea Kersten, Kerstin Kersten, Arto Koskinen, Antti Matikkala, Werner Neuss, Hannu Rautkallio, Freek van Rijsinge, Sune Sahlstedt, Boris Salomon, Pauline Taubach, Tapio Tamminen, Jos Verlaan, Jan Wellmann ja Lars Westerlund. Interview excerpts from the film ‘Who was Felix Kersten?’ are featured from: Yehuda Bauer, Ulf Brandell, Louis De Jong, Arno Kersten, Irmgard Kersten, Friedrich Klingenberg ja Sir Hugh Trevor-Roper. Arto Koskinen and John Bernstein try to find new material on Felix Kersten and the movements of the white buses in Sweden’s national archives. But time is running out, and Koskinen wants answers. We also hear from Jan Wellmann, John Bernstein, Boris Salomon and Jos Verlaan. Who was Felix Kersten? Was Walter Schellenberg, the intelligent, pedantic, and creative chief of the SS’s counter-espionage division, behind Kersten’s act? Arto Koskinen delves into Felix Kersten’s relationship with Elisabeth Lüben, his former landlady’s daughter, who Kersten often called his sister. We hear from Boris Salomon and investigate Walter Schellenberg’s relationship with royal families of Sweden and England. What happened in Gut Harzwald? And who did the Swedish Red Cross’s white bus save there in 1945? Dutch journalist Jos Verlaan talks about Kersten’s connection to Holland’s nationalist socialist aristocrats and the Oxford group. Arto Koskinen and John Bernstein make findings in the book “Zodiac and Swastica”, written by Wilhem Wulff, Himmler’s astrologist. They find out a potential explanation for Kersten’s quick rise as a massage therapist. What surprises are found near Gut Harzwald? Arto Koskinen, John Bernstein, Toby Bernstein and Pauline Taubach visit the farm Felix Kersten used to own in Gut Harzwald. Koskinen shares the news with Dutch reporter Jos Verlaan. Did Kersten save Finland’s Jews? Arto Koskinen and John Bernstein meet historian Hannu Rautkallio who tells them his point of view on Felix Kersten’s wartime relationship with the Finnish government. Investigative reporter Boris Salomon reveals to Bernstein and Koskinen the kinds of deals Felix’s friend, businessman Ernst Ukkonen, made with the SS with Kersten’s help. Felix Kersten, who was recommended for a Nobel Peace Prize, refuted his political association to the SS in his memoirs. But what about the proof and assertions that insisted otherwise? Arto Koskinen tries to find out about Kersten’s SS membership with the help of historians Lars Westerlund and Hannu Rautkallio. He also researches Operation Reinhardt with John Bernstein, and they uncover a familiar name in the process. Who was the mysterious Master Ko who taught Felix Kersten to be a massage therapist? Arto Koskinen interviews non-fiction writer Tapio Tamminen and tries once again to get in touch with Felix Kersten’s son, Arno Kersten. Koskinen eventually meets Andrea Kersten, the daughter of Kersten’s other son, as well as her mother, Kerstin. They reveal Felix Kersten’s last words. What if Felix Kersten wasn’t Felix Kersten? Arto Koskinen and John Bernstein go back to researching documents about this new angle. 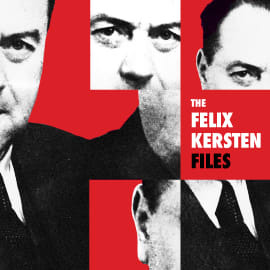 Lars Westerlund, a judicial and government history researcher, and military history researcher Sune Sahlstedt review Werner Neuss’s theory that Felix Kersten had stolen his identity. Arto Koskinen travels with his friend John Bernstein, John’s son Toby Bernstein, and Toby’s girlfriend Pauline Taubach to meet Werner Neuss who has some shocking theories on Felix Kersten’s identity. The group ends up on a bridge on the Saale river in Halle, Germany. This is the place where Felix Kersten’s story may have begun. We will also hear opera singer Leon Lishner in this episode. Did the director of Sweden’s Red Cross write a letter to Himmler that opposed the transfer of Jews to Sweden? Or was the letter that was known as the Bernadotte letter, which was signed by Count Folke Benadotte, a forgery - and whose typewriter was it written on? Arto Koskinen gets so deep into his research that he’s sometimes not sure if the events are all a dream. Koskinen meets historian Gerald Fleming and producer Jan Wellmann. We also hear from historians Yehuda Bauer and Sir Hugh Trevor-Roper, journalist Ulf Brandell and Felix Kersten’s son, Arno Kersten about the different views on the Bernadotte letter. How is it possible to leave behind such a conflicting life story? Arto Koskinen examines information and documents on Felix Kersten, but finds more questions than answers. We hear quotes from the film ‘Who was Felix Kersten?’, from Felix Kersten’s middle son, Arno Kersten; Felix’s wife, Irmgard Kersten; Friedrich Klingenberg who was a concentration camp prisoner who worked on Kersten’s farm; and historians Sir Hugh Trevor-Roper, Yehuda Bauer and Louis De Jong. We will also hear from investigative reporter Boris Salomon, Dutch journalists Freek van Rijsinge and Jos Verlaan as well as Swedish journalist Ulf Brandell. When Arto Koskinen made the documentary film about Heinrich Himmler’s physical therapist and healer in the late 1990s, a warning light went off right away for the filmmakers. Or were the bad omens just due to an overactive imagination? Historian Antti Matikkala reveals the reasons for the honorary titles bestowed on Felix Kersten, and the film’s producer Jan Wellmann reminisces how it all started.